Adhesive bandages are sticking plasters or dressings used for small injuries that are not of major concern and not serious enough to require a full-size bandage. They protect wounds from further injuries, friction, bacteria, and dirt. They heal wounds and hold cuts of the skin. Adhesive bandages are available as medicated or non-medicated bandages. Medicated bandages are those bandages that are directly used for healing wounds with some medicament. They are used for injuries to repair cuts, abrasions, burns, etc. Non-medicated bandages are used in the food industry for the prevention of process contamination and for the purpose of orthopedic support. The global adhesive bandages market was valued at around US $ 2,900 Mn in 2017. It is expected to expand at a CAGR of around 3.0% to 3.5% from 2018 to 2026. The medicated bandages segment dominates the global market in terms of value and is expected to maintain its position during the forecast period. The for adhesive bandages market is expanding significantly, owing to a rise in the incidence of injuries due to recreational activities in all age groups and rise in the aging population, which is more prone to small accidents such as falls. Moreover, arise in the incidence of domestic as well as work place injuries and launch of different variants of adhesive bandages such as butterfly stitches are major factors likely to drive the global adhesive bandages market. The global adhesive bandages market has been segmented based on product, material, indication, distribution channel, and geography. Based on product, the global adhesive bandages market has been classified into medicated bandages and non-medicated bandages. The medicated bandages segment has been further sub-divided into cohesive fabric bandages and flexible fixation bandages. The medicated bandages segment dominated the market, owing to a rise in the incidence of injuries and higher efficacy of medicated bandages in healing wounds faster. The non-medicated bandages segment has been further categorized to cohesive fabric bandages and flexible fixation bandages. The cohesive bandages sub-segment is dominated in this category, due to the wide applications of cohesive bandages in the food industry as blue metal detectable bandages for contamination free processes and also in orthopedic support activities after surgery. I terms of material, the global adhesive bandages market has been divided into woven fabric, plastic, latex strip, and others. The plastic segment dominated the market and is expected to expand at a higher CAGR during the forecast period, as plastic bandages offer convenience, more innovative options, and lower raw material costs. In terms of indication, the global adhesive bandages market has been classified into wound management, edema control & pain management, orthopedic support, and others. The wound management segment dominated the global adhesive bandages market. A rise in the incidence of work-related & sports injuries, increase in the aging population, and better wound infection control for minor injuries are some of the factors attributed to the growth of the wound management segment. Based on distribution channel, the global adhesive bandages market can be segmented into hospitals & clinics, retail stores, e-commerce, and others. The hospitals & clinics segment dominated the global adhesive bandages market, due to a rise in the number of emergency admissions and better-equipped first aid facilities available at hospitals & clinics. The e-commerce segment is projected to expand at a significantly higher CAGR. This is attributed to better discounted rates and convenience offered by e-commerce sites. In terms of region, the global adhesive bandages market has been segmented into North America, Europe, Asia Pacific, Latin America, and Middle East & Africa. Asia Pacific dominated the global adhesive bandages market, followed by North America in 2017. The market in Asia Pacific is estimated to expand at a prominent CAGR during the forecast period, due to a larger patient pool with higher injury incidence rate and increase in the aging population, which is more prone to injuries. Key players operating in the global adhesive bandages market include Johnson & Johnson Consumer Inc., 3M, Essity Aktiebolag(publ). (BSN Medical), Beiersdorf AG, Smith & Nephew plc, ConvaTec, Inc., Cardinal Health, Medline Industries,Inc., DYNAREX Corporation, and Detectaplast. Adhesive bandages are dressings that are used to treat small injuries and wounds and stick or bind small skin incisions during small accidents. They protect wounds from further injuries, friction, bacteria, and dirt. They heal wounds and hold cuts of skin. These bandages are small sticking plasters or small dressings used for minor injuries that are not of major concern and not serious enough to require full-size bandages. Adhesive bandages are available as medicated or Non-medicated bandages. They have wide applications in wound management, edema control, and post-surgical compressions. They are also used in orthopedic support and the food industry to prevent process contamination. In the food industry, they are used as specialized blue metal detectable bandages. Nowadays, decorative bandages are more popular among kids for small injuries. 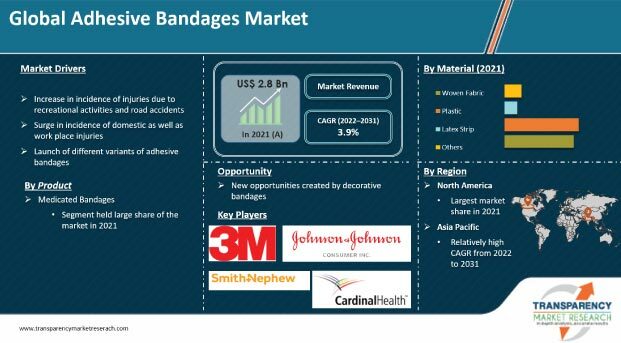 The adhesive bandages market is expanding significantly, due to a rise in the incidence of injuries due to sports, recreational activities, adventure activities, and road accidents. A rise in the aging population, which is more prone to orthopedic surgeries and injuries due to falls and an increase in domestic and work-related injuries among all age groups are estimated to propel the global adhesive bandages market. Some new Product Type offerings, such as butterfly stitches, by major players are also fuelling the growth of the global market. The adhesive bandages market has been exclusively analyzed based on Product Type, material, indication, distribution channel, and by geography. Based on Product Type, the global market has been segmented into medicated bandages and Non-medicated bandages. Both of these segments are further sub-segmented into cohesive fabric bandages and flexible fixation bandages. In terms of material, the global adhesive bandages market has been classified into woven fabric, plastic, latex strip, and others. Based on indication, the global market has been divided into wound management, edema control & pain management, orthopedic support, and others. In terms of distribution channel, the global adhesive bandages market has been categorized into hospitals & clinics, retail stores, e-commerce platforms, and others. Each of the segments has been analyzed in detail for market trends, recent trends and developments, drivers, restraints, opportunities, and useful insights. The report offer current and future market size for each segment and sub-segments for the period from 2018 to 2026 in terms of revenue in US$ Mn, considering 2017 as the base year. The compound annual growth rate (%CAGR) has been provided for each segment and market for the period of 2018 to 2026 with market size estimations. In terms of region, the global market has been divided into North America, Europe, Asia Pacific, Latin America, and Middle East & Africa. The regions have been further sub-segmented into major countries and sub-regions. The current and future market sizes in terms of revenue (US$ Mn) of these regional markets and their major countries have been provided in the report for the period from 2016 to 2026, with their growth rate (%) for the period from 2018 to 2026. The study also offers a list of recommendations, highlights, and some useful insights of the market. It provides useful insights to new companies willing to enter the market. It will help existing companies increase their market shares and in the decision-making process. The market overview section of the report demonstrates market dynamics and market trends such as drivers, restraints, and opportunities that influence the current and future status of the adhesive bandages market. The report also covers market revenue projections, market attractiveness analysis, and key market share analysis in order to provide a thorough analysis of the overall competitive scenario in the global adhesive bandages market. The report concludes with the company profiles section, which includes key information about major players in the market. Key players identified in this report are Johnson & Johnson Consumer Inc., 3M, Essity Aktiebolag(publ). (BSN Medical), Beiersdorf AG, Smith & Nephew plc., ConvaTec, Inc., Cardinal Health, Medline Industries,Inc., DYNAREX Corporation, and Detectaplast.. Each of these players has been profiled in the report based on parameters such as company overview, financial overview, business strategies, Product Type portfolio, business segments, and recent developments.